This week, tens of thousands of game fans descended on Cologne Germany for Gamescom – if not the biggest gaming convention in the world, then certainly not that far off. A big chunk of those fans couldn’t wait to get their hands on Forza Horizon 4 (especially if the queues to play the game were anything to go on). Not only did we have a hands-on demo available for Gamescom attendees, we also hosted press in behind-the-scenes interviews, showing off never-before-seen content from the game. One bit that received special attention was a Halo-themed Showcase event, starring the famed Warthog and featuring voiceover by Cortana herself. The event hasn’t been shown to the public… yet. 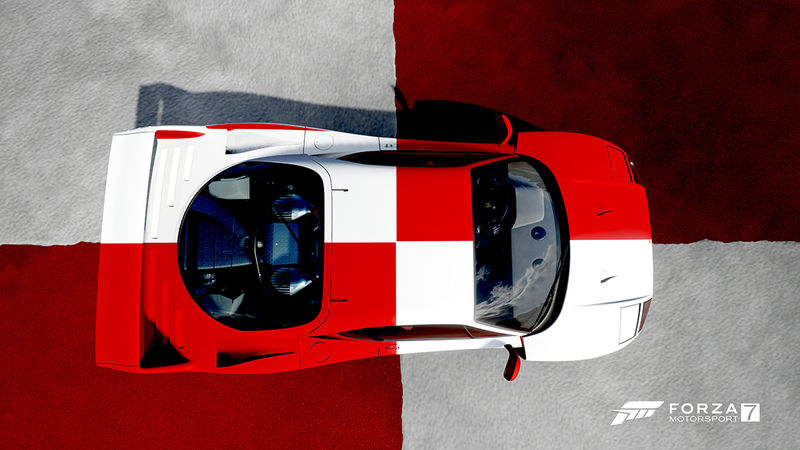 In fact, we’ll have the world debut of the Halo Showcase on the September edition of “Forza Monthly,” our monthly broadcast show about all things Forza. 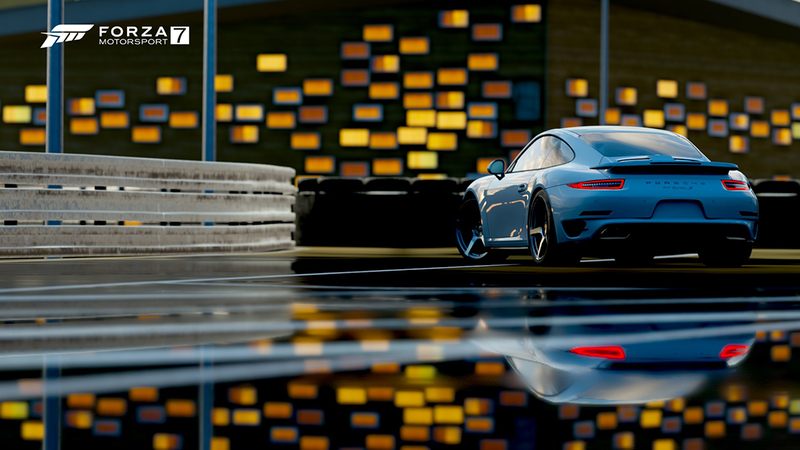 Look for more information on when the September “Forza Monthly” will air in next week’s edition of the Forza Week in Review. Forza Horizon 4’s appearance on the Gamescom edition of Inside Xbox was a centerpiece of the week. Xbox’s Graeme Boyd was joined by Ralph Fulton to talk about the latest news on the game, including details on Online Adventure, the shared world of Forza Horizon 4, and more. If you missed it, here’s the video (fast forward to the 2 hour 20 minute mark for the Forza Horizon 4 segment). Also at Gamescom, Ford launched a new vehicle – the Ford Ranger Raptor – and announced that the rugged new truck will be coming to Forza Horizon 4. To clarify this news, while the Ranger Raptor will be coming to Forza Horizon 4, it will not be available at launch in the game. We will update the community on the Ranger’s official release in Horizon 4 in the future. 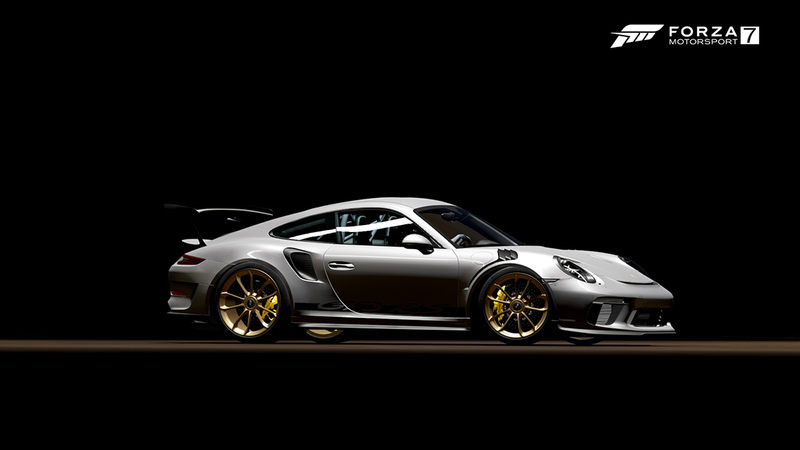 Finally, if you haven’t yet pulled the trigger on Forza Horizon 4 and are looking for a deal on some great hardware, Xbox announced two new Forza bundles at Gamescom. The first combines the Xbox One S with Forza Horizon for $299; the second features the Xbox One X with both Forza Horizon 4 and Forza Motorsport 7, available for $499. Both bundles include an Xbox Wireless controller, 1 month of Xbox Game pass, and 14 days of Xbox Live Gold. Finally this week, Xbox unveiled Spotify playlists for several upcoming exclusive Xbox games, including Forza Horizon 4. To check out the Forza Horizon 4 Soundtrack Snapshot on Spotify, featuring artists like M83, Greta Van Fleet, Beck, and more, follow this link. Look for the reveal of the full soundtrack for the game soon. It’s time for another Turn 10 Bounty Hunter event and the action starts today! We’ve got four Turn 10 employees taking part in this event, including Yours Truly. As always, we’ve got tons of rewards available for every one of us you beat. Your targets in this month’s Bounty Hunter are Shay (GT: spartyyon), Kari (GT: SpiderGoggles) and Aaron (GT: Euro Nation) along with me (GT: Mechberg) and you’ll get a chance to meet them on today’s Bounty Hunter Kick-Off edition of #ForzaFriday, airing live today at 3 p.m. Pacific on our Mixer and Twitch channels. We’ll spend some time chatting with each T10 participant, then pick their player rewards, before setting them live on the track to record their initial times. Don’t miss the show! Remember all of these rewards are cumulative so, for example, if you beat all four T10 contestants, and end up in the top 10 percentile on the leaderboard, you win all of the rewards listed above! Our latest Turn 10 Bounty Hunter will be on through August and into September, and we’ll be keeping the community up to date with lap times as we go. Happy hot-lapping! 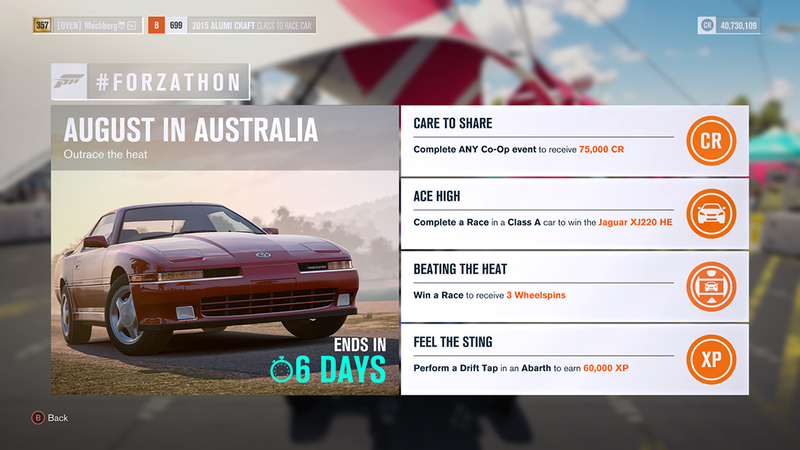 “August in Australia” is the theme for this week’s #Forzathon events in Forza Horizon 3. 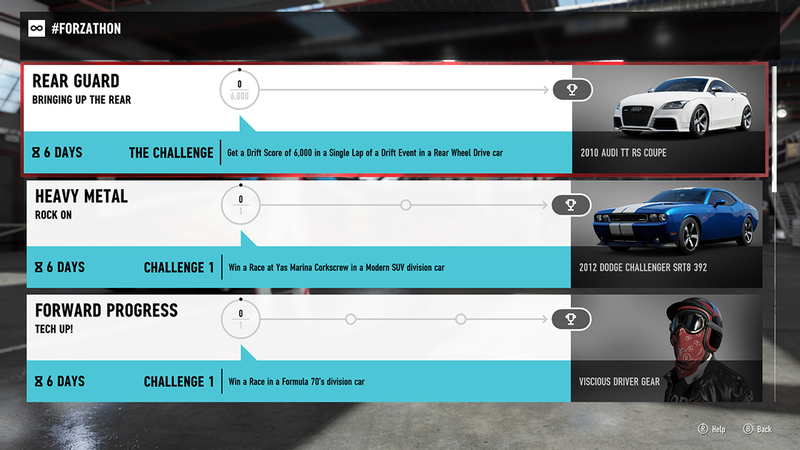 Complete these events while you’re cruising around the country and load up on credits, XP, and wheelspins, and the Jaguar XJ220 Horizon Edition. That’s it for this week. Don’t miss today’s #ForzaFriday livestream kicking off today at 3 p.m. Pacific for the start of our August Bounty Hunter event. See you then!